A controversial paper questioning the ‘Out of Africa’ theory of human origins was recently published in the journal Advances in Anthropology. There are quite a lot of references to the origins of humanity in the Cs transcripts, so that’s what I want to discuss in this installment of the Hit List series. I’ll get to the paper in question a bit further on, but before I do, there’s a bunch of background material to cover. The references from the Cs are given in a certain context and concern ideas and possibilities that probably won’t make much sense without covering certain ground first. That said, there’s way too much material to cover in one article, so I suggest checking out the books I’ll be referencing and reading them in full if anything here strikes the reader’s interest. Pop culture has conveniently provided a starting point from which to take off on these topics. In June, Ridley Scott released the much-anticipated prequel of sorts to his blockbuster film, Alien, titled Prometheus. Leaving aside any discussion of the artistic merits of the film, it does cover some themes relevant to the subject at hand. The plot revolves around the idea that life on planet earth, and presumably other planets in the galaxy, was not a chance happening. In the film, a race of pale-skinned, muscular and hairless humanoids ‘seeds’ life on planets through acts of sacrifice. An ‘engineer’, as they’re called in the film, gives his body to be broken down into its constituent parts, providing the source DNA from which life will take root. The human characters in the film fund a space mission to ‘meet their makers’ at a location indicated in ancient artwork found all over the world. The film leaves the question of the ultimate origins of life open, allowing conventional evolutionary theories (i.e., neo-Darwinism) and so-called ‘intelligent design’ (or biogenetic engineering) to coexist as compatible options. In other words, the engineers ‘intelligently’ seeded life on earth, after which evolution took its natural course (with a possible ‘tweak’ here and there over the course of history), resulting in the wealth of DNA-based life forms that characterize our planet. The origin of the engineers is left untouched – a further mystery to be pondered. Back in the real world, the fact of the matter is that no one knows how life actually started on planet earth. Let me repeat that: no one knows. All we have are various theories, none of which has been scientifically demonstrated to have actually occurred. At best, most scientists will say itmust have occurred a certain way, simply because they have excluded other options as not worth considering. In fact, we may have a pretty good idea of some of the evolutionary mechanisms that have been in effect since the hypothetical first single-celled organism, but how that organism got there in the first place is a mystery, and open to speculation. Historically, there have been five or so categories under which various theories have been proposed. First, of course, there’s creationism: the idea that ‘God’ created all the forms of life in one way or another. Then there are the various theories of ‘spontaneous abiogenesis‘. This is the idea that somehow ordinary chemistry spontaneously resulted in the formation of primitive biological materials, which somehow acquired the ability to self-replicate and evolve all on their own, whether on crystals, or by some other mathematically improbable and as-yet-unobserved natural process. Panspermia, popularized by scientists Sir Fred Hoyle and Chandra Wickramasinghe, is another option whereby organic materials are said to exist throughout the universe and are carried by cosmic wanderers like asteroids and meteoroids, to then be deposited on some lucky planet, et voila! The fourth option, directed panspermia, promoted by Francis Crick (co-discoverer of the DNA molecule), posits that life was deliberately seeded by an already existing intelligent race somewhere in the galaxy. As in Prometheus, that leaves open the question as to their own origin. Engineer Bryant M. Shiller proposes a fifth option in his book Origin of Life: The 5th Option. Shiller calls it rational design, probably to distinguish it from intelligent design, many proponents of which are Christian. While they don’t often mix their theology with their science, based on what I’ve read of the intelligent design camp’s work, the connection is a contentious one, prompting suggestions from critics that their ‘science’ is just a cover for pushing a religious agenda. That may be true in some cases, but I don’t think it’s a valid argument in most. Shiller’s take on the subject, for example, is anything but religious. That said, there are some metaphysical implications to the theory. It follows from all of the above that life had an intelligent designer or engineer. Not necessarily DNA-based, mind you, but intelligent nonetheless. But what is intelligence? To borrow and adapt an analogy from Shiller’s book, let’s say someone takes ten thousand pennies and throws them up in the air. (And for the sake of levity, let’s also assume their hands are large enough to perform such an action.) Sure, the chances of them all landing with heads up is as likely as any other specific combination, but what would you think if you came across ten thousand pennies on the floor, all showing heads? Personally, I’d think someone had intentionally placed them like that, or suspect some other form of intelligent trickery, like double-sided or specially weighted coins, for example. Thinking about this action in terms of the laws of thermodynamics, nothing is amiss. The energy invested in placing each coin is the same whether it is done randomly or in a pattern, and energy is lost as entropy when work is done. But when looked at in terms of information, not so. Intelligence has come into play, made clear by the meaningful form taken by the placement – increased order as opposed to disorder. (Life and evolution does the same thing.) As Shiller puts it, “intelligently applied energy introduced to any system is able to overcome randomness and to control the outcome of events”. (p. 274) And as I mentioned above, as human beings, we recognize that. We see words on the page and recognize them for meaningful language, not random letters that have coincidentally formed themselves into sentences that we then project meaning into. And even when controlling events which are incredibly unlikely if left to chance, we can perfectly control their outcome every single time. We have intelligence, and to a greater or lesser degree can recognize signs of intelligence. It’s here that Shiller sees a way to test his theory. If some form of intelligence actually engineered DNA, and thus life itself, it is possible it left a ‘signature’ of sorts. Shiller believes the most likely place for this would be in so-called ‘junk DNA’, portions of which have been highly conserved between species over billions of years, seemingly for no purpose. (Note: Each year, scientists are discovering more purposes for junk DNA, meaning it’s definitely not junk. However, some parts still seem to serve no discernible function: In 2004, Edward Rubin and his team removed sections of this highly conserved DNA, measuring over 1.6 million base pairs long, from mice, with no discernible effect on the animals. They repeated a similar experiment in 2007, with certain modifications, and the same result.) Perhaps these conserved sections are the ultimate ‘message in a bottle’? If some pattern or message is discovered, it would be undeniable proof of intelligent bio-engineering. Coincidentally, in the same year that Shiller’s book was published (2005), Christopher Knight and Alan Butler made the same speculation in their book, Who Built the Moon? They traced the idea to physicist Paul Davies (1994). The idea makes me wonder if the Cs’ ‘tribal unit’ remark (quoted in part four) might be such a signature? And just recently, on 17 August 2012, this article was published on Extreme Tech: ‘Harvard cracks DNA storage, crams 700 terabytes of data into a single gram‘. Scientists have been eyeing up DNA as a potential storage medium for a long time, for three very good reasons: It’s incredibly dense (you can store one bit per base, and a base is only a few atoms large); it’s volumetric (beaker) rather than planar (hard disk); and it’s incredibly stable – where other bleeding-edge storage mediums need to be kept in sub-zero vacuums, DNA can survive for hundreds of thousands of years in a box in your garage. It is only with recent advances in microfluidics and labs-on-a-chip that synthesizing and sequencing DNA has become an everyday task, though. While it took years for the original Human Genome Project to analyze a single human genome (some 3 billion DNA base pairs), modern lab equipment with microfluidic chips can do it in hours. Now this isn’t to say that Church and Kosuri’s DNA storage is fast – but it’s fast enough for very-long-term archival. Just think about it for a moment: One gram of DNA can store 700 terabytes of data. That’s 14,000 50-gigabyte Blu-ray discs… in a droplet of DNA that would fit on the tip of your pinky. To store the same kind of data on hard drives – the densest storage medium in use today – you’d need 233 3TB drives, weighing a total of 151 kilos. In Church and Kosuri’s case, they have successfully stored around 700 kilobytes of data in DNA – Church’s latest book, in fact – and proceeded to make 70 billion copies (which they claim, jokingly, makes it the best-selling book of all time!) totaling 44 petabytes of data stored. Perhaps that is already being done, and we just haven’t looked for it? [I]t is not unreasonable to imagine that information sits at the core of physics, just as it sits at the core of a computer. … It from bit. Otherwise put, every ‘it’ – every particle, every field of force, even the space-time continuum itself – derives its function, its meaning, its very existence entirely – even if in some contexts indirectly – from the apparatus-elicited answers to yes-or-no questions, binary choices, bits. ‘It from bit’ symbolizes the idea that every item of the physical world has at bottom – a very deep bottom, in most instances – an immaterial source and explanation; that which we call reality arises in the last analysis from the posing of yes – no questions and the registering of equipment-evoked responses; in short, that all things physical are information-theoretic in origin and that this is a participatory universe. And information is inextricably linked to intelligence. As to the nature of the intelligence(s) behind life and the universe, the Cs have suggested various levels of ‘super-intelligence’, from hyperdimensional beings to the mind of the universe as a whole. As Shiller puts it, information can only come from intelligence, and intelligence itself can only come from intelligence. Intelligence must somehow be rooted in the fundamental structure of the universe, perhaps as an additional ‘dimension’. Q: What does the rest of the DNA code for that is not coding for structural genes. What else can it be doing? A: Truncated flow [of] liquids. Q: […] (L) Does truncated flow mean a flow of liquid that has been stopped? Q: I assume that this was truncated by the Lizzies and cohorts? Q: Okay, can you tell us what this specific liquid or transmitter [is that] was truncated? Q: (L) Well, I’ll have to research it. The fact is, we’ve got 3 billion base pairs … do some of these so-called segments of “junk DNA,” if they were activated, would they instruct chromosomal replication to take place with more than 23 pairs as a result? 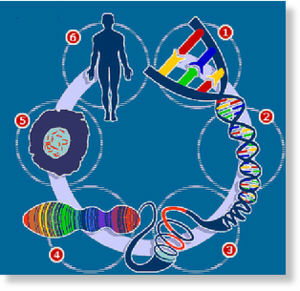 Q: Are there any limitations to what our physical bodies can transform to if instructed by the DNA? Could we literally grow taller, rejuvenate, change our physical appearance, capabilities, or whatever, if instructed by the DNA? Q: (A) It means how good is your receiver. Q: So, that is the whole issue of gaining knowledge and developing control over your body. If your mind and CNS are tuned to higher levels of consciousness, that has significance in terms of your receivership capability? Q: (L) Okay, we have a question that Psyche and I have been thinking about. After reading this book about viruses, we have the idea that viruses may be the means by which genetic manipulation [as in intentional, coming from other densities] has taken place on this planet for millions, if not billions, of years. Q: (L) Does that mean that a virus is a transdimensional manifestation? A: Yes. Thoughts made manifest! Compare to some crop circles! Q: (Psyche) Some viruses in the atlas DO look like crop circles. [wind noise muffles Ark’s question] (Ark) … of course virus is just pure DNA, or what? (Psyche) It can be both DNA or RNA depending on the type of virus, and usually coated to protect itself. There are so many types of viruses; it can be just a piece of genetic code. (Ark) Okay, so my question is whether there is a particular part of the virus that has the property that is not just described by normal quantum physics or quantum chemistry and so on, or its the whole organization of virus that has this property? A: Yes. Information field aggregates matter. Q: (talk of thought vs. information) (Belibaste) Does information command or direct the aggregation of different proteins or amino acids to form a virus? Materialization? Q: (Psyche) It’s very interesting because they have found in our “junk” DNA, properties of viruses that are close in location to those of stem cells, and also cells that end up producing cancer. It is quite interesting. (Perceval) That means our DNA is thought made manifest? Q: (L) Did the soul’s presence in the ape body [HK: i.e., the bodies on earth before modern humans] cause its genetics and DNA to change? With that in mind, let’s move on to the paper I mentioned in the first paragraph. It’s titled ‘Re-Examining the “Out of Africa” Theory and the Origin of Europeoids (Caucasoids) in Light of DNA Genealogy’, and was written by Anatole A. Klyosov and Igor L. Rozhanskii. As the title makes clear, it brings into question the alleged scientific consensus on the topic of human origins, which states that all modern humans can be traced back to a group that originated in Africa and then spread out to populate the globe. In other words, the theory says that all modern humans can trace their ancestry via mtDNA (passed on solely through the female line) back to a single African woman (‘Eve’) who lived in Africa 160,000 years ago, and via the Y-chromosome to a single man (‘Adam’) some 140,000 years ago – humanity’s ‘most recent common ancestors‘. The authors of the new paper also used a technique to calculate common ancestors between groups. Using a sample of 7556 haplotypes from 17 major haplogroups, they compared specific genetic sequences and their differences, calculating the number of mutations and the time necessary for those mutations to occur from the original ‘pure’ sequence – the common ancestor. (Their methodology for this technique is described in the ‘Materials and Methods’ section of their paper, as well as here. Needless to say, the accuracy of their dating is only as good as the mutation rate in their formula, which I am not qualified to evaluate.) They did this for all the groups tested, comparing each to the other, and thus ended up with a ‘tree of life’ diagram showing the relationship between all the groups, each branch representing a splitting off from the common ancestor. However, the resulting chart shows a completely different picture of human origins, which I’ll reproduce below. But first, here are the relevant transcripts from the Cs. Q: How long, in our terms, did it take to bring these Celts to this planet? Or, is this ongoing? Q: Were the Jews that were genetically engineered and then planted in the Middle East … what year was this? Q: (L) Okay, moving on to the next question: Are Semites a mixture of Aryan genetics and Black genetics as I*** and I have theorized? Q: … to then be spread via their mixture with Aryans – as Semites – into other races? Q: (L) What is the other part? A: Genetic tweaking of Semites. Q: (H) In reading through the transcripts in the 9/11 book [Laura’s and Joe Quinn’s 9/11: The Ultimate Truth], I was confused about the genetic tweak that was made 130,000 years ago. Was that a tweak that was done to all the Semites, so it wasn’t only the Jews? Q: (H) So the real Semites are the Aryans? Q: (H) Then the genetic tweak, was it made in the Aryan Semites or was it made in the Jews that we know as Jews today? A: Aryan. Reason for destruction of Jews of the “Abrahamic” line. Q: (L) Okay. So the next question is: The putative Nostratic speakers in East Asia include the Asians that I think were the original shamans which I’ve discussed in Secret History and elsewhere, Altaic speakers in particular. So if this is the case, and if Nostratic as a linguistic group can be correlated with an original population from Kantek, does that mean that both the early shamans of East Asia and the circle-people of Europe (with the pyramid people further south) have their origins on Kantek? Q: (L) And does the difference in phenotype between the two groups indicate admixture of the East Asian Kantekkians with a more native group that was already on Earth? A: Yes. And notice the ongoing dispute over the “out of Africa” versus the “out of Asia” groups. It is an improper assumption.Out of Kantek vs out of Earth is a better formulation. 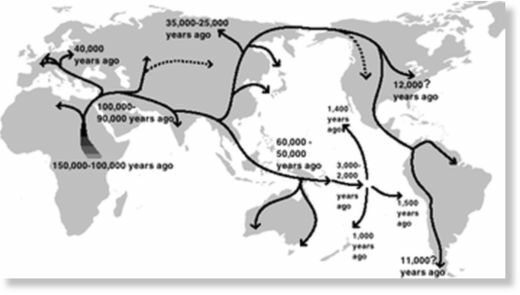 The first map below shows the hypothesized human migration path ‘out of Africa’. The second adds the various mtDNA haplogroups. Note the relatively well-defined geographical groups (Asian, African, and European). According to Masatoshi Nei, Professor of Biology at Pennsylvania State University, the analysis of clusters of genetic distances between groups confirms the traditional grouping of humanity into three main ‘races’: Negroid, Caucasoid, and Mongoloid (including Australoid and Amerindoid). The concept was based primarily on the premise that Africa possesses the highest variability, or variance, of the human DNA and its segments. Set apart, it is not a strong argument because a mix of different DNA lineages also results in a high variability and … is largely what occurs in Africa. [HK: In other words, African groups have been evolving longer (mutation-wise) than more recent groups, giving rise to the higher variability.] Moreover, a genomic gap exists between some Africans and non-Africans, which has also been interpreted as an argument that the latter descended from Africans. A more plausible interpretation might have been that both current Africans and non-Africans descended separately from a more ancient common ancestor, thus forming a proverbial fork. A region where this downstream common ancestor arose would not necessarily be in Africa. In fact, it was never proven that he lived in Africa. Apparently, haplogroup B was initially not of an African origin. It could have migrated to Africa and mixed there with a local Negroid population. A common ancestor of the present-day bearers of haplogroup B lived 46,000 ypb [years before present]. … The Mongoloid and Austronesian haplogroup C split ~36,000 ypb and gradually populated regions of Central Asia, Australia and Oceania. 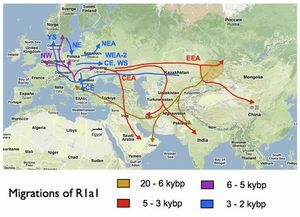 Haplogroup DE split to D and E around 42,000 ybp, and currently populates vast territory from North Africa to the west to Korea and Japan to the east. 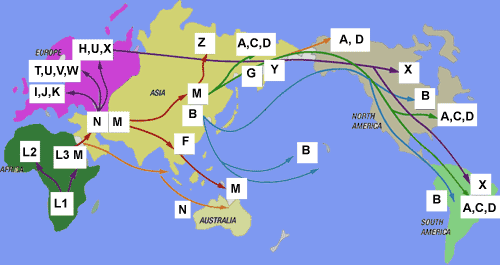 The family of haplogroup[s] from F through T is largely the Europeoid (Caucasoid) family. Most of the bearers of these haplogroups remained Europeoids; however, some populations have acquired racial features of the prevailing races in a given region, recently or in the long past. 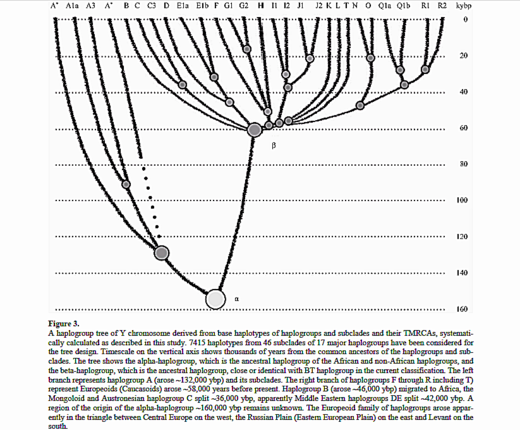 … It cannot be excluded, of course, that haplogroup A might have appeared elsewhere and then migrated to Africa. However, there is no reason to believe (and fewer reasons to insist) that the Europeoid family originated in Africa. Here’s the diagram, which accompanies the paper. You all know what they say about pictures! The question is, what caused the expansion? While the Cs’ explanation may be a literal description of what happened (i.e., ‘hundreds of millions’ of Kantekkians somehow transported to earth), it may not be. Keep in mind what I wrote about the slippery nature of ‘prophecy’ in part one. In Chapter 10 of her new book, The Apocalypse: Comets, Asteroids and Cyclical Catastrophes, Laura gives a number of hypotheses, ranging from comet-borne DNA to ‘atomized body parts’ entering earth’s atmosphere as a result of the destruction of the ‘Fifth Planet’. Whatever the case, the idea of ‘extraterrestrial genes’ isn’t that incredible when looked at in light of modern science, especially in light of the news that NASAmay have found microbes on Mars 37 years ago. [Carbon dating] is based on several assumptions, one of which is false. For this method to work, the rate of production of carbon-14 in the atmosphere has to remain constant through time. In truth, however, the amount of carbon-14 in the atmosphere varies with fluctuations in solar activity and Earth’s magnetic field, changes in atmospheric conditions and even the exploding of atomic bombs! When comparing radiocarbon dates with dates derived from tree rings, known as dendrochronological dating, the dates only agree accurately as far back as A.D. 640 [HK: Note that Mike Baillie argues for a period of cometary bombardment 100 years before this date, as I discussed in part three], and only generally well back to the time of Christ. Anything further back and the dates are as much as 800 years off. So scientists made calibration charts to make up for the variation. But they still have to verify their calibrations with samples of known dates. There is still a problem! Radiocarbon dates can only be trusted up until the record left by trees can back them up. There is no other way to verify the calibration charts accurately! Scientists, however, will push the envelope to 10,000 B.C. without any way to verify it. Q: (L) Now, the general scientific opinion is that the major dying of dinosaurs occurred 65 million years ago. You have given us the figure 27 million years ago. Can you explain the discrepancy? A: Radio carbon dating is not exact science. Q: (A) Carbon dating. Is it incorrect by a factor of two prior to 10,000 years as Laura has suggested? We observe a factor of 2 variation in the scientific dating versus your dating. This is a repeating phenomenon on nearly all dates you have given. Q: (L) How can these magnetic aberrations affect radiocarbon dating? Ephraim Fischbach, a physics professor at Purdue, was looking into the rate of radioactive decay of several isotopes as a possible source of random numbers generated without any human input. … As the researchers pored through published data on specific isotopes, they found disagreement in the measured decay rates – odd for supposed physical constants. What could the flare send forth that could have such an effect? All of the evidence points toward a conclusion that the sun is “communicating” with radioactive isotopes on Earth, said Fischbach. But there’s one rather large question left unanswered. No one knows how neutrinos could interact with radioactive materials to change their rate of decay. So a factor of 2 might resolve some of the discrepancies and make sense of the sudden and mysterious appearance of Cro-Magnon on planet earth – and all they apparently brought with them: art, culture, shamanism. Q: (L) How did the Scythians get to Egypt? And by Scythians I mean the group living in Scythia – parts of modern-day Central Asia, Eastern Europe and the northern Caucasus – from around 900 BCE to 200 CE. Q: (L) Was Sargon a Scythian? First of all, note that the names of these two groups refer primarily to the kingdoms or empires they established in certain parts of history. While the ‘Hittites’ technically existed before the ‘Scythians’, this does not exclude the possibility of some group of ancestors living in the same region migrating south to Anatolia. What genetic analysis that has been done on ancient Scythian bones has only found haplogroup R1a. This haplogroup is frequent in many Europeans and South Asians and probably originated in Central Eurasia, the region occupied by the Scythians. R1a has also been found in low frequencies in Armenia and northern Anatolia, possibly suggesting “that a hybrid group of R1a-R1b from the Volga-Ural region migrated to this region sometime between 2000 BCE and 1650 BCE.” Sargon, the ‘Great King’ of Akkad, is suggested to have lived 2334-2279 BCE, or close enough for horseshoes. So there is some evidence suggesting a possible incursion of ‘Scythian’ types into Hittite territory close to the time mentioned by the Cs. Q: (L) Where do the Scythians come from? Q: (L) How did they get to China? Q: (L) So, they started off from the Caucasus, went to China, and were later driven back West by the Chinese? Is that it?